I am definitely not sure. I have thought of pursuing law school after college. I know that I want to pursue some kind of role in which I can fight for social justice, but I don’t know in what way I will do so. I am still exploring! Currently, I am a mentor for the Bridge Scholars Program and Questbridge chapter at Colorado College. I mentor upcoming freshmen from different backgrounds throughout their transition to college. I became a mentor because there is no way that I would be where I am now without the people who have challenged me and encouraged me along the way. As a mentor, I want to ensure that upcoming students understand that their presence matters and empower them to pursue their vision of success. I am also part of the Honor Council, which upholds academic integrity on campus. Since last year, I have been a part of the Inclusion and Diversity Committee which ensures that the processes within the honor council and those surrounding the honor code create a system that is fair to all students. I joined the Honor Council in the first place because JROTC definitely instilled in me the importance of integrity. I slowly learned the unjust processes that existed and joined the Diversity and Inclusion Committee to address these issues. 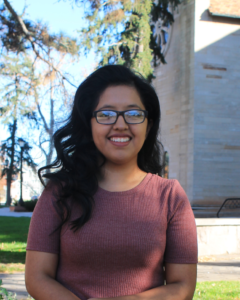 I am also a part of Humans of Colorado College, based on Humans of New York, in which I get to listen to the narratives of individuals at CC and then share that with our community. I joined this project because, for me, true connections are those in which you truly get to know people and their story. I know that everyone has something different to share and I find it meaningful and beautiful to listen to the unique narratives of every individual. My high school counselor is one the most important mentors in my life. My high school years bring me many fond memories, but they were also the toughest years of my life and my counselor was always there for me when I need her. I trusted her with everything and she would listen patiently. She offered me opportunities and continues advocating for students like me. Mrs. GT helped me understand my limits, understand my worth and pushed to become a better person. The best advice I have ever received is to hold on to the vision that I have for myself. This is honestly advice that I received just a couple days ago, but one that I realized has kept me going through the hurdles that I have experienced. I have this vision for myself, that is blurry and mostly unclear, but one in which I am part in creating change. This is a vision that is hard to hold onto and hard to keep believing knowing all the obstacles on the way, but if I keep that vision in mind I know that I am, in a sense, empowering myself to always chose the path of resiliency. Dolores Huerta and Cesar Chavez come to mind because of the impact that they had on worker rights. After going to Texas and learning a bit about the history of farm workers and the oppression they faced, I would really love to get a sense of the passion that continues to drive Huerta and that drove Chavez to mobilize people in demanding the rights they deserve. I find their dynamic particularly interesting and would want to understand it through each of their points of view.